RAISE YOUR HAND IF YOU LOVE FREE STUFF. ALSO RAISE YOUR HAND IF YOU LOVE MACARONI AND CHEESE (Me. Right here). Well, YOU, internet friends, are in all kinds of luck today – because I have some OH SO DELICIOUS mac and cheese for you AS WELL AS a super stupendous giveaway from my friends over at Saucy Mama (you remember them & their awesome mustards). But first, this mac and cheese. (If you could care less about mac and cheese – GASP, HOW ARE WE EVEN FRIENDS – you can scroll down for the giveaway good stuff). But really, I think a trip to Vegas and the World Food Championships would be SO. COOL. So I was obviously determined to make this macaroni and cheese the best thing I’d ever put in my mouth. And you guys – this pasta is LIFE-CHANGING. I made it again for lunch today because I couldn’t stop thinking about it. BAH. SO GOOD. 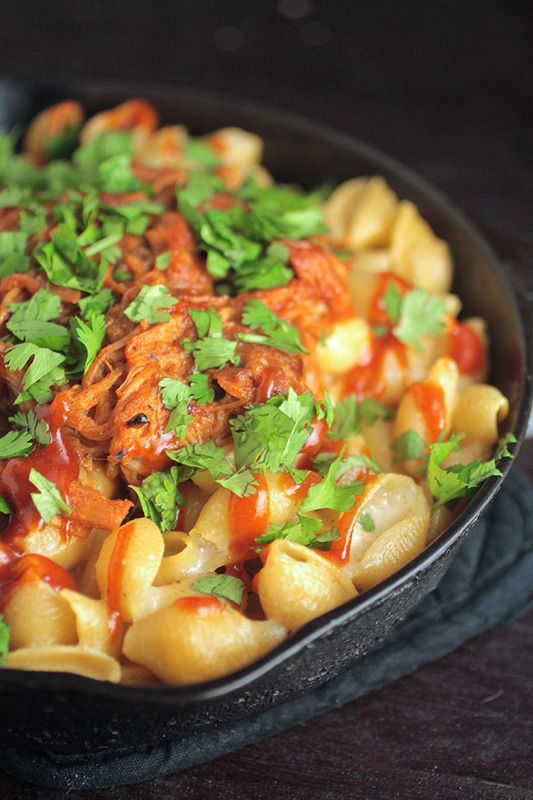 I’d been toying with the idea of pulled pork white cheddar mac and cheese for awhile, and when I tasted Saucy Mama’s Honey Barbecue I knew that it and me and pork and mac and cheese were meant to be. TRUE LOVE, y’all. The Honey Barbecue goes so perfectly with a simple, sharp white cheddar cheese sauce, and the fresh cilantro adds a light pop of flavor to break up the smokiness of the pork. OH, and did I mention you make the pulled pork in a SLOW COOKER? It’s so easy! I’m in love. But you knew that already. Now for the giveaway! One lucky reader will win a set of Saucy Mama’s new wing sauces (seen below). That’d be the Honey Barbecue – which you could immediately use to make this mac and cheese – along with the Jamaican Jerk and Orange Habanero – YUMM-O. Having tasted them all myself, I can personally attest to their deliciousness. Also, you know what I love about Saucy Mama (aside from the fact that they’re in Oregon/Home Sweet Home/The best place in the universe)? You can pronounce every ingredient in their sauces. EVERY SINGLE ONE. No piles of chemicals or questionable additives, here – just real, normal, find-it-in-your-own-pantry ingredient lists. As someone who boycotts store-bought sauces on the regular because I hate eating all those yucky preservatives, I am a huge fan of Saucy Mama. THIS GIVEAWAY IS NOW CLOSED. Thank you to all who entered, and congratulations to the winner, Elizabeth! 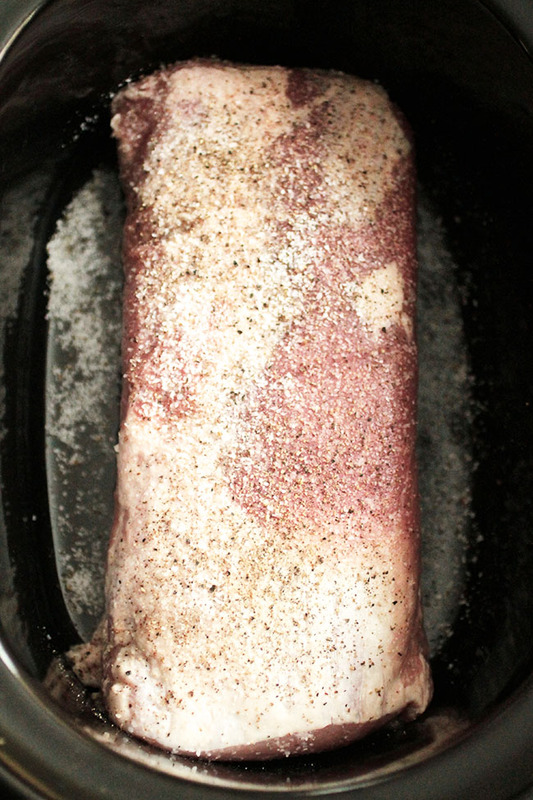 Season pork roast with salt and pepper on all sides. Don't be stingy with the salt - there's a lot of pork there that all needs to be seasoned! 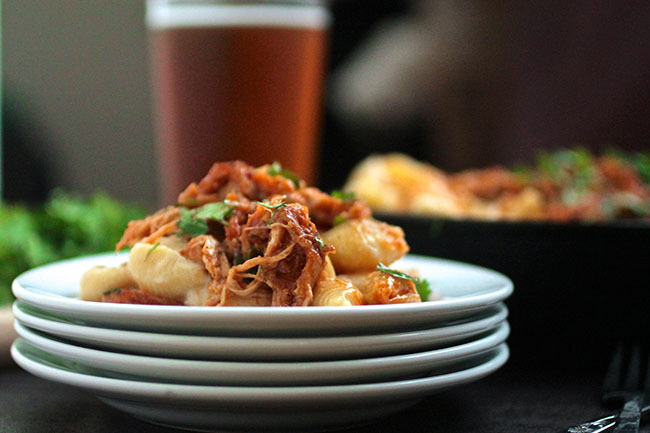 Place pork in a slow cooker along with beer (I love a good stout or IPA, but use a lighter version if you aren't a fan of hoppy beers) or root beer. Cover pork and cook on low for 6-8 hours, until it shreds easily with a pair of forks or tongs. Remove pork from slow cooker to a cutting board and drain liquid from slow cooker. 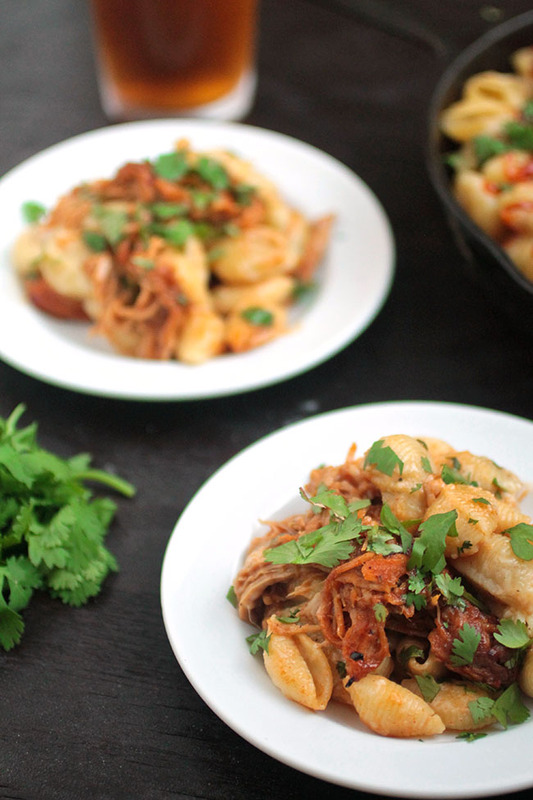 Return pork to slow cooker and shred it with a pair of forks or tongs. 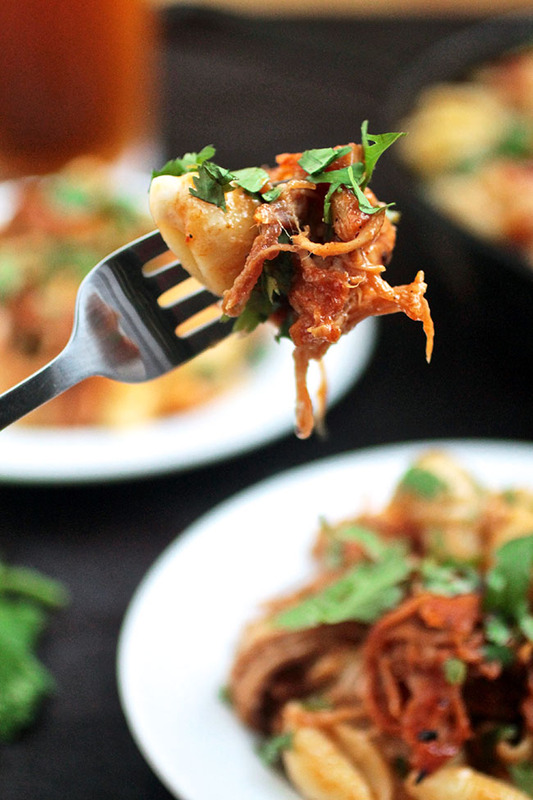 Pour Honey Barbecue sauce over shredded pork and mix well. Re-cover and return the slow cooker to low heat to let the flavors meld while you prepare the macaroni and cheese. Cook pasta in very salty water until 3 minutes less than al dente. Drain and set aside. In a large pot (I use the same one I cooked the pasta in!) melt butter over medium heat. When butter is melted, whisk in flour to form a roux. Let cook until darkened in color and fragrant, about 1-2 minutes. Add milk to roux a little at a time, whisking constantly to work out any lumps. Cook over medium heat, whisking occasionally, until sauce has thickened - about 8-10 minutes. Remove sauce from heat. Stir in white cheddar cheese with a spoon or spatula. Continue to stir until cheese is melted and you have a smooth sauce. Add cooked pasta to sauce and toss to coat. Transfer pasta to a large skillet (mine is about 10") or baking dish. 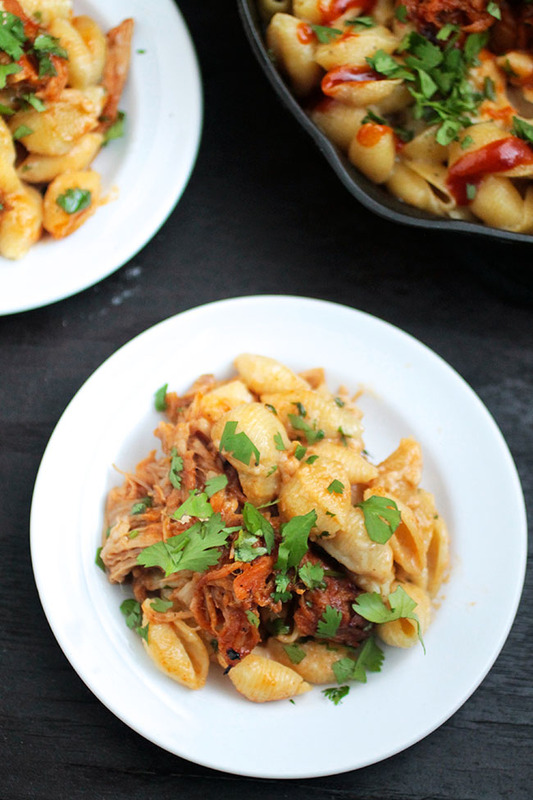 Top pasta with honey barbecue pulled pork. I like to pile the pork close to the center, so that people can control their pork to pasta ratio as the mac and cheese is served. Also, it just looks so pretty! Bake pasta at 375 degrees F for 15-20 minutes, until edges are slightly crispy. 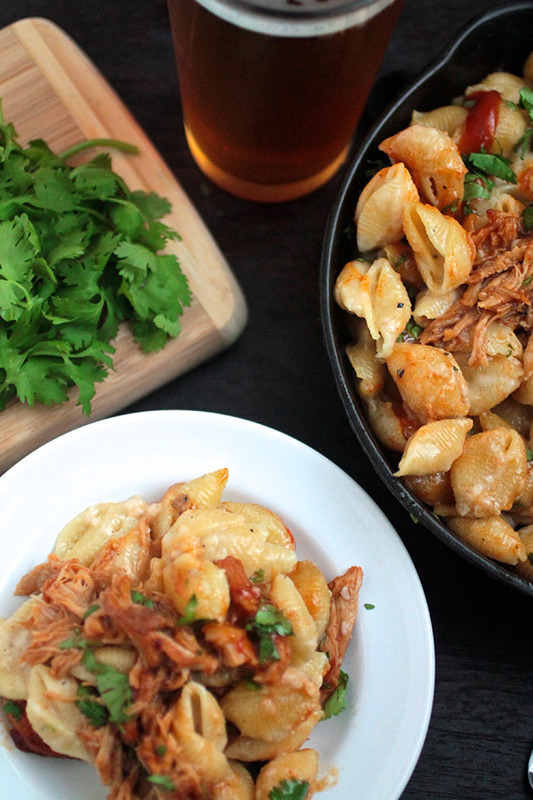 Drizzle remaining ¼ cup honey barbecue sauce over the top of the pasta and top with chopped cilantro. Serve immediately. I like my pasta saucy, but not drowning. If you like a LOT of cheese sauce on your pasta, I suggest doubling the sauce recipe and increasing the pasta called for to 1 lb. TIP: If a cheese sauce is ever clumpy, zap it with an immersion blender for a few seconds to turn it into a smooth sauce! Disclaimer: I received a promotional kit of Saucy Mama Sauces free of charge in exchange for my participation in this contest. All recipes, photos, thoughts, and opinions are my own. I’d love to try these; thanks! Friends! Jon Lovitz! Tartlettes! That is all. YES. You’re totally my hero. yum! I love saucy mama! WHY DO I READ THESE RECIPES RIGHT BEFORE I EAT LUNCH I’M SO HUNGRY UGHHHH. I’m dying now. I make pulled pork all the time and I would love to try Saucy Mama’s Sauces.I would love to win so I can try your pulled pork mac & cheese. Oh my goodness this is a wonderful combination!!! I invite you to share your yummy blog at my blog hop ( today through Sat). I hope you will add your giveaway to my giveaway page too. Hugs P.S. don’t forget to enter my giveaway too.